The Princess was eight years old before she knew she was different. Until then, she’d always thought of herself as strikingly beautiful with her human torso and mermaid tail. Long hair danced around her face whenever she swam. Her tail, with its iridescent green scales and translucent apple-green fin, was her best personal attribute. The red jewel embedded in her forehead sparkled in shafts of sunlight cascading through the waters in which she swam. A fiery smile and wild streak often got her into trouble with other water sprites. On the day she realized her difference, she’d awakened just like any other. She ate breakfast with the Dragon King and then stayed by his side as he welcomed a guest from the world above her ocean home. This guest, a very learned and stuffy man, talked of esoteric subjects like dharma, enlightenment, and a lovely place called Nirvana. The Princess sat and listened to his long oratory on something called the Middle Way. He explained austerities that a practitioner must endure to “attain enlightenment” and “enter the Buddha Way.” Perplexed, she began to question the guest. He endured her questioning with good humor, but stopped her when she asked how she could enjoy this enlightened state. “Oh, my! You are a Dragon Princess and a girl. Girls cannot attain enlightenment.” He laughed, scrutinizing her open face. “What do you mean, girls cannot attain enlightenment?” she asked. “It simply is not done,” the guest replied. The Dragon Girl sat silent a bit longer. She would listen to his teachings that morning and prove him wrong. 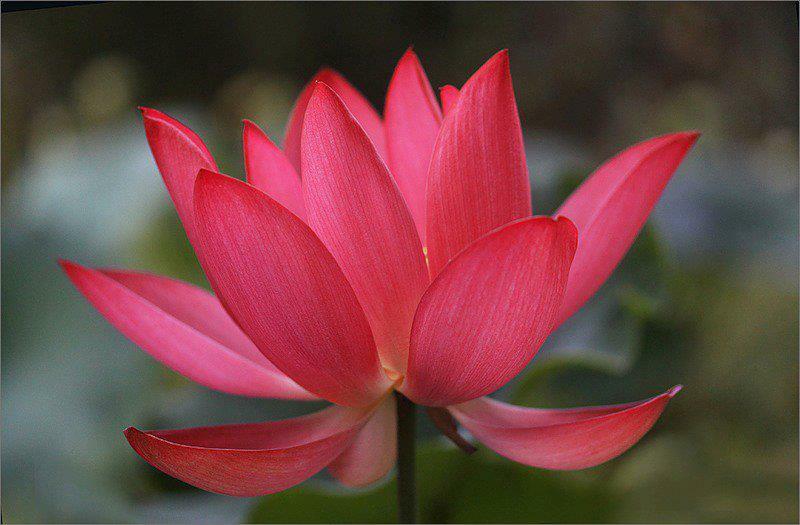 A key theme of Shakyamuni Buddha’s final teaching, the Lotus Sutra, is the possibility of the enlightenment of women. The eight-year-old Dragon Girl appears in the Devadatta Chapter of the Lotus Sutra (Chapter 12, pg. 187). Also known as “The Naga Princess,” she represents the ability to attain enlightenment just as we are, without changing form or gender. Nagas were believed to inhabit oceanic palaces located in the depths of lakes, rivers and the sea. They guarded the treasures of the oceans and protected the source of life—symbolized by their ability to shed their skin—birthing their own renewal repeatedly. Described as incredibly beautiful, a female Naga could be easily recognized. Her exquisite face featured a jewel in the center of her forehead. It was considered a compliment to say that a woman possessed a “Naga Princess’ beauty” (Diana Paul, Women in Buddhism, pg. 185). In the middle of his long sermon, the Dragon Girl began to float and swim in concentric circles. Her hair darkened and her face filled with light. She spoke eloquently to her family and friends and performed countless teachings and practices, accepting and embracing without a single iota of doubt the storehouse of profound secrets preached by the Buddha. Her meditation, in front of the whole group, allowed her to grasp deep Buddhist doctrine and immediately reach a level of no regression. Throughout this transformation, she remained half human and half dragon—and a girl. The princess, in just one morning, became fully endowed with the blessings of compassion for the suffering of all living beings. She attained enlightenment without changing her female form. The guest found it hard to hide his astonishment. 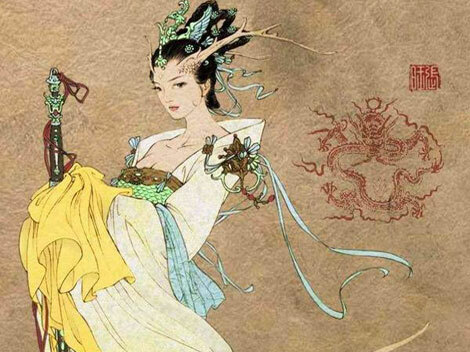 He returned to the airy world above the Dragon Girl’s home, and reported the girl’s enlightenment to the Buddha. The Buddha was pleased. This news filled a number of his closest followers with disbelief. The disciples could not mask their shock. Yet, just as they started to protest, the Dragon Girl suddenly appeared before the assembly. Several prominent disciples raged at the girl. The girl smiled. She plucked the red jewel from the middle of her forehead—a jewel worth “a thousand-millionfold world”—and bowed before the Buddha, offering it to him with great humility. “I offer up my life to the Buddha and embrace the True Way,” she said. The Buddha readily accepted her gift. The crowd buzzed and shouted at her. To the astonishment of those present, the princess instantaneously transformed herself into a man. Then she snapped her fingers and changed back. “My enlightenment happened quicker than that!” she told the crowd. Then she took her place seated next to the Lord Buddha. The story of the Dragon Girl was one of the first Buddhist parables I heard after I converted to Buddhism 27 years ago. I immediately felt a sisterly bond with the Naga Princess. At the time, I had been struggling with clinical depression for as long as I could remember. I dropped out of my courses at NYU, ostensibly because I couldn’t afford the tuition, but in reality, I was too depressed to stay awake in my classes. Waiting tables six nights a week, I stumbled home from work just as David Letterman and Johnny Carson came on. I watched Jay Leno, Ellen, Jerry Seinfeld and others crack jokes on Carson and Letterman, feeling laughter rise in my throat. Those evening snippets of laughter saved my life. With Chinese takeout and late night comedy, I floated in an airless limbo for almost a year. Then in July of 1985, on a breezy Saturday that would ultimately change the entire direction of my life, I met an exuberant Latina woman. She told me about Buddhism. That night, we attended a meeting. Buddhism appealed to me because it emphasized the inherent power of the person (whether male or female) as a container of divinity. Even as a small child, I believed that. I loved the saints, like Joan of Arc or Theresa, who conversed with angels and were depicted with halos of golden light surrounding them. I believed that I had a direct line to spirit, that it coursed in my blood, as a part of every living creature, tree and rock in my world. That first night, when we stepped off the elevator in a high rise on East 23rd Street, I noticed the smell of sandalwood. A disembodied male voice chanted. The buzzing of an active hive of golden bees swirling in patterns wafted from behind a closed door. As we opened the door and moved into the apartment, the buzzing intensified. We stopped to take off our shoes before being ushered into the main room. A man sat lotus-style in front of an altar. White candles burned and dripped next to a bowl of pomegranates. Motes of dust danced in the air. Those present held a brief prayer meeting just for me. We chanted and talked. Everyone exuded joy and an infectious inner light. I wanted that. I converted to Buddhism three nights later. It seems a strange thing for a 25-year-old Caucasian woman to do, but in doing so my life finally started to make sense. Buddhism transformed my life from one of sadness, stasis and depression, into one of purpose and great joy. Mind you, this transformation (unlike the Dragon Girl’s enlightenment) did not happen instantaneously. The past three decades have not been easy. My fortune has accumulated slowly, bit by bit. I once heard another Buddhist describe enlightenment as something akin to a snowstorm. If we look at each individual snowflake as it falls to earth, it doesn’t look like much. But over time, hour upon hour, the snow accumulates. When we awaken, we see drifts of beautiful white snow surround us. Enlightenment is like that. Perhaps our lives are shattering around us and we feel the need to completely “shape-shift” and change direction. That’s necessary at times. Sometimes the container that has easily held our lives for years suddenly feels small. Our “pond” becomes a thimble. It may, in fact, be time to shake things up. The important point is to recognize we are vessels of enlightenment no matter what our lives look like from the outside. We initiate transformation as an internal shift. These inner changes are then slowly reinforced and reflected in our outer circumstances. Our changes—the equivalent of spiritual seismic shifts of consciousness—are usually invisible to others until a while after that. Buddhist wisdom has sustained me for twenty seven years while my life falteringly grew, shattered, changed, clipped, edited, and revised itself. I experienced spiritual death and spiritual rebirth. Friendships and relationships ended; my father died; I returned to graduate school; changed jobs; moved from city to city; and finally became a writer, and a college professor. I am certain my belief and trust in the spiritual guidance given to me [through my practice] has continually opened doors to me that I might not have seen otherwise. The Dragon Girl, with the jewel in the middle of her forehead and her absolute belief in her own worthiness, inspires and heartens me. She is my sister, my mother, my mentor, my muse. She lets me know that transformation is possible. She teaches me to handle my life with compassion and to have deep belief in possibility. I imagine myself, a container of blindingly beautiful sparks, as someone just like her. I swim with her in my dreams and awaken with an undeniable feeling that the jewel that is my life itself never leaves me. That is what attracted me to Buddhism all those years ago, and that is what has kept me returning to it. I possess a “diamond chalice” of enlightenment just as I am. I am the Dragon Girl. You are the Dragon Girl. Thanks, Peter! I am glad you enjoyed it. It is a beautiful story, that of the Naga Princess and your own journey. It reminds me of my experience 35 years ago, in my late 20s of encountering Nicheren Daishonen Buddhism in a NY apartment. I was given a Gohonzon, told to chant, and not much else. Unfortunately, I didn’t hit it off with the people involved, who were a little too focussed on the role of the Gohonzon itself. It felt like idolotry to me and, as a Christian, I felt it wasn’t for me, even though, in principle, I don’t think Buddhism is incompatible with Christianity. Right now I am taking a Teachco.com course in Eastern religious thought. Maybe I will come to a new point of view. Thanks, Paul! I appreciate you sharing part of your spiritual journey with me. I recently converted to Buddhism myself from no religion at all, also in a very dark time in my life. I was taking a class on Buddhism in Japan because I had always loved anime and ancient Japanese mythology. Sitting in class, having not done the reading due to similar problems with depression, the professor called on me, asking me to explain an aspect of basic buddhist belief which the other students could not answer. I thought for a moment, and decided to wing my own belief at him. He realized I was making it up from my own belief and he stared at me for a moment, and eventually said I was right, then after a brief pause, he continued on with the class. He pulled me aside after and told me he believed I should look into Buddhism, because he saw it in me already. This sparked the revival of my love for writing, brought me to my future career and current schooling in culinary, and made me happy again, I’m no longer depressed, I sport a lotus flower with the lotus mantra in tibetan above it, tattooed over my scars from attempted suicide, and I look at them with joy, after 6 years of hating them – feeling like I have purified my body of that mistake. Reading this was so brilliant because I see in the beginning of your journey, what I am currently going through. I am working on a book where I reference the dragon princess, as I feel a connection to her, and in reading this, I feel as if I myself had written it in another life. If you have not read it – find “The Buddha in the Robot”. Also, if you wouldn’t mind, I’d love to shoot you the beginnings of my book, and discuss the journey of Buddhism as an American caucasian woman – I feel as if it is fate after reading this essay – my email is lenalake@gmail.com. Enjoy your journey should we not cross again.